General Intelligence and Reasoning-25 quastions for 25 marks. Numerical Aptitude-25 quastions for 25 marks. General English-50 quastions for 50 marks. General Awareness-50 quastions for 50 marks. Time duration-10.00 A.M. to 12.00 Noon. Short essay/Letter in English or Hindi-50 marks.Paper II will only be of qualifying nature. Essential qualification-Matriculation or equivalent pass OR ITI pass. Age as on 23.01.2017-18 to 25 years.10 years relaxation for Physically Handicapped candidates. 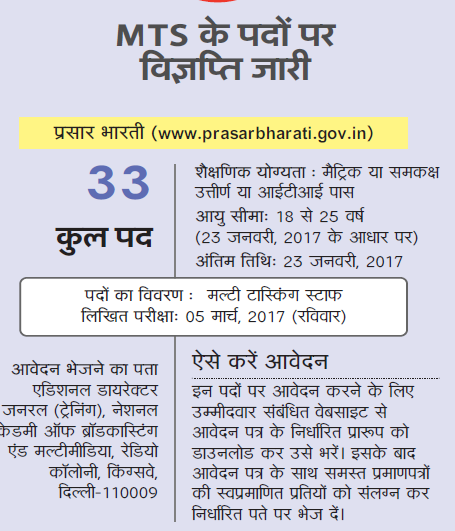 Last date of application-23.01.2017.For remote area -30.01.2017. 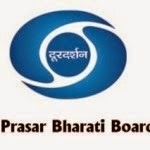 Address for application-Additional Director General (Training), National Academy of Broadcasting and Multimedia, Radio Colony, Kingsway, Delhi-110009.Applications sent by any other mode except Registered Post / Speed Post will not be accepted. No TA will be provided for appearing in the examination. Name in Block Letters,Name of Father,Date of Birth,Gender,Nationality,Category,Whether seeking Age relaxation? (Write Yes/No),Aadhaar Number,. E-mail ID,Contact Numbers,Address,Have you ever been convicted by a Court of Law?,. Educational Qualifications,Experience, Copies of Testimonials.